It was awesome going to The Improv with you and Anthony last night. It was a great lineup (until the end). Dwayne and Todd Barry were the best ones. 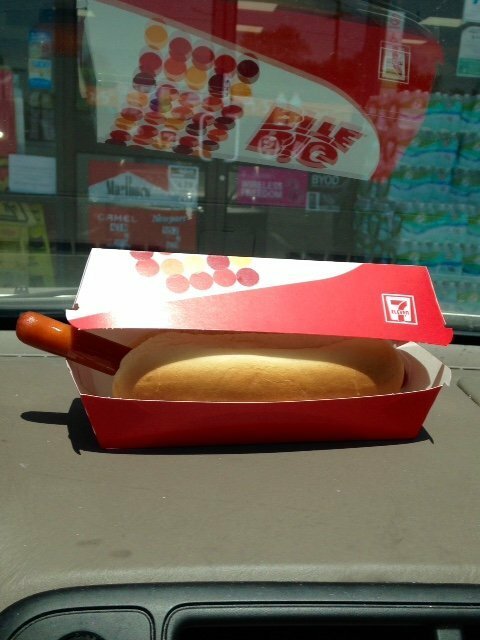 But since we didn’t get photos last night, I have posted my disappointing Dodger Dog from today’s 7-Eleven pilgrimage. Not only did it have a beef-jerky-like consistency, I thought it would come with a better bun and box. That is one long wiener! What a funny picture. I betcha your dashboard is hotter than the 7-eleven hot dog rollers, or whatever that thing is called. Dwayne Perkins and Todd Barry totally rocked The Improv! Such fun! Thanks for taking us Bud. Love you!